Companion planting is an ancient method of planting wherein gardeners plant various plants close together to encourage successful growth. Corn and beans are often grown together as the bean can use the corn stalk as a pole to grow on. Companion planting is also used as a pest deterrent for many plants as certain bugs stay away from some types of plants, thus making what is grown together a good combination. Till the garden space to a depth of 6 inches. Make a furrow in the bed 1 inch deep using the handle end of a garden hoe. Plant both okra and radish seed together, 3 to 4 inches apart in the row. The radish as it grows will help keep the soil loose, allowing the okra plant to establish deeper, stronger roots. Allow both the radish and the okra seed to germinate and grow. Harvest the radishes and thin the okra plants to 12 inches apart. Plant pepper transplants between the thinned okra plants. The peppers help to repel cabbage worms, which feed on the young okra plant leaves and pods. When the okra is ready to harvest, wear long sleeves and gloves. The small spines on the leaves and the pots can cause skin irritation. 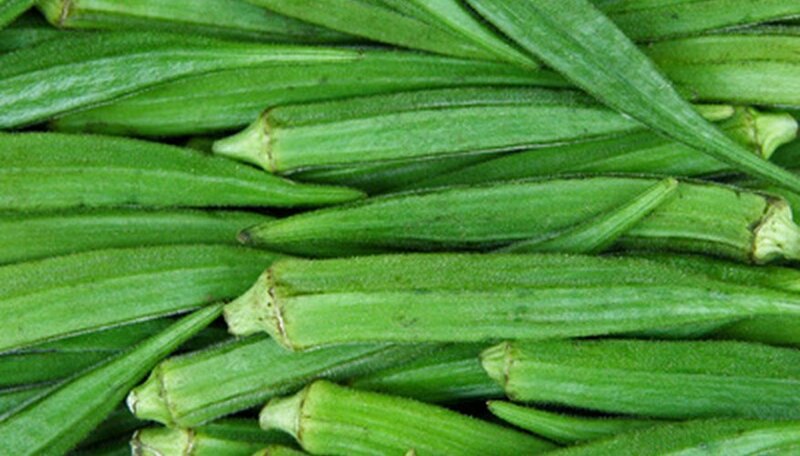 Cut okra pods from the plant using scissors or a sharp knife. Okra is often grown in flower gardens as a tall ornamental plant.